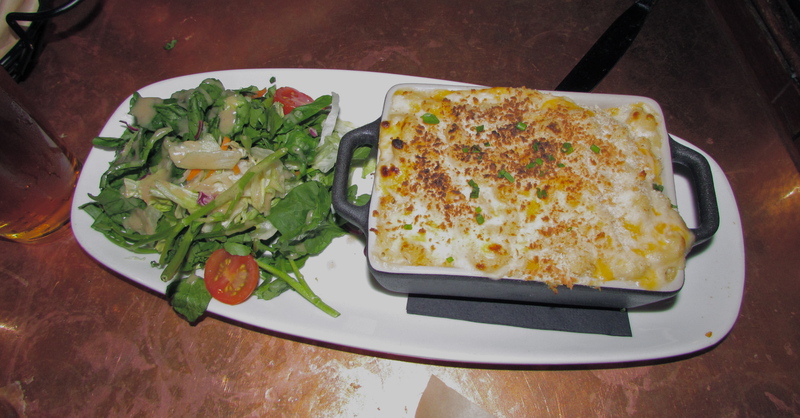 First and very much foremost is the ultimate comfort food, mac ‘n’ cheese. The warm, creamy, cheesy hug in a dish. Teddy’s Bar and Grill is a historic gem in amongst the trendy offerings of Williamsburg, Brooklyn. Established in 1887, it’s no wonder this historic drinking hole looks like a traditional Sam Smith’s style pub you’d find in central London. The place is bursting with character, the staff are friendly and we had no trouble getting a table. I’m not sure that the photo above really does this meal justice, but it’s up there with the best mac ‘n’ cheese I’ve ever tried. I’m salivating just thinking about it. With a mixture of three cheeses – gruyere, parmesan and cheddar, breadcrumbs and mixed greens with a simple side salad, each creamy mouthful leaves you feeling warm and happy. Wash it down with a pint of local Kelso pilsner and you’re in for a top night. Shake Shack is the new fast food craze. On the flight out to NYC, I read the latest edition of Glamour magazine, where Taylor Swift rated it as one of her favourite places to eat. And the girl speaks sense. 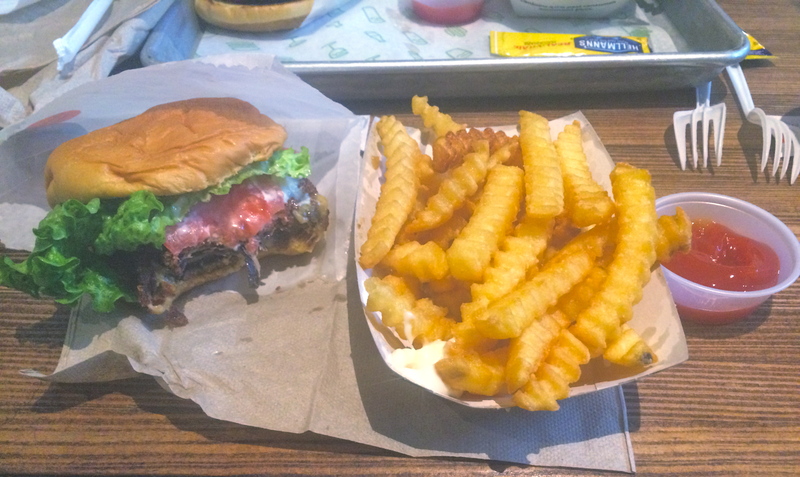 I found myself in two different Shacks over the week, once for frozen custard ice cream and the other burger and fries. I think veggie burgers are really hard to get right. Often unimaginative and either horribly soggy or bone dry, it’s unusual to come across a show-stopping meatfree patty. But Shake Shack’s ‘Shroom Burger is an absolute delight: a succulent portobello mushroom filled with melted muenster and cheddar cheese in crispy breadcrumbs with fresh salad and signature ShackSauce. And their crinkle cut fries are amazing. If you’re in NYC any time soon and after some fresh and tasty fast food, stop by a Shake Shack if you can – there are branches all across the city. The only downside is that they list the number of calories in each different dish. This is an occasion when ignorance is most definitely bliss. We ended up in this place by chance; having been told we’d have to wait up to an hour and a half to get a table at Roberta’s Pizza next door. I don’t care how good the pizza is, I’m not being told by a blase hipster that I’m going to have to wait that long. I’m getting too old to be bothered about the hype of those kind of places. 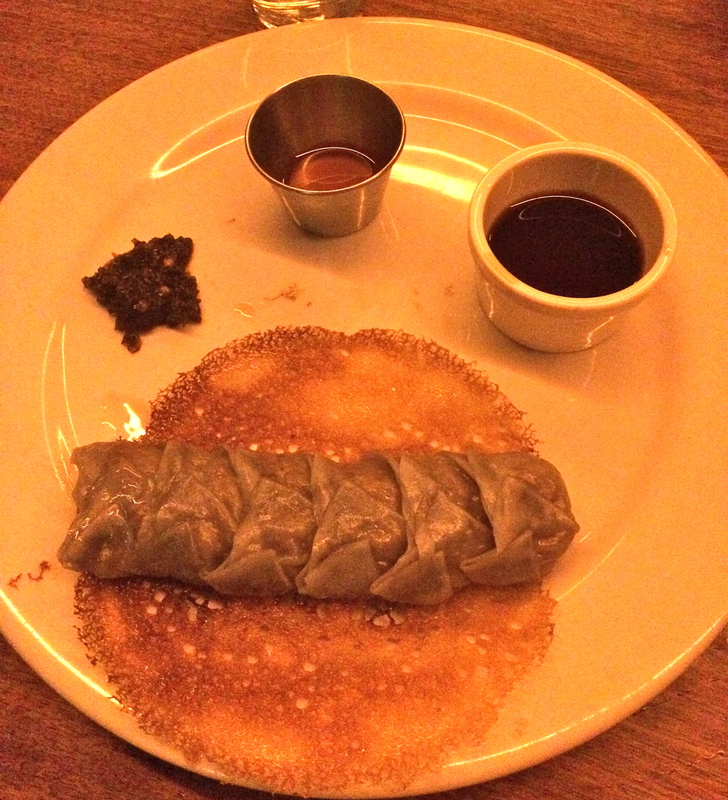 Luckily, MoMo was an absolute delight. They got us a table within minutes, the staff were really attentive and the food was healthy and innovative. With a wealth of vegan and vegetarian options, we got a mixture of Japanese-inspired dishes, including rice croquettes filled with squash, sage, walnut and mozzarella, vegan gyoza and sushi inside tofu skin. 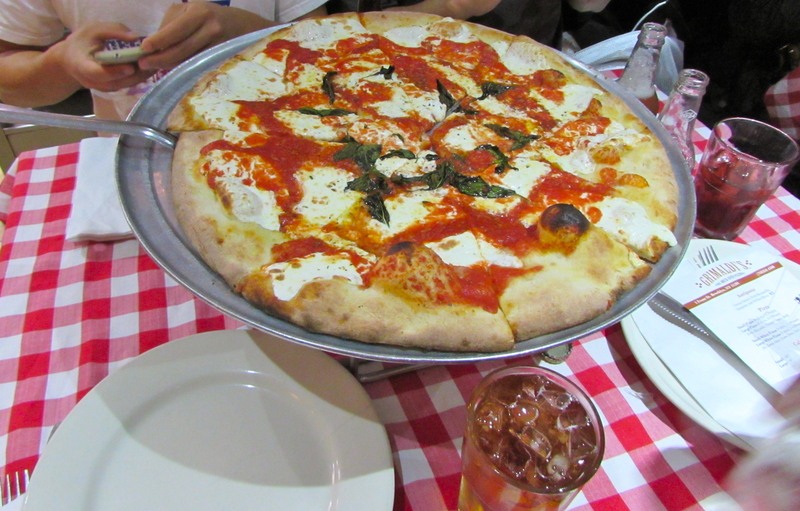 If you want a traditional, freshly made Italian-American pizza from one of the best rated pizza places in New York, then get yourself to Grimaldi’s under the Brooklyn Bridge. What makes it special? The freshly made pizza pies (as the locals call them) are cooked in a coal-fire oven which gives them a unique taste; the buffalo mozzarella is delivered daily from a local supplier; and the place is family-run (albeit with a history of ridiculous feuds). Be prepared to wait as there is usually a queue out the door, unless you go on the Slice of Brooklyn Pizza Tour – which I highly recommend – then you can skip the queues and get straight down to eating. It’s a bus tour hosted by local Brooklynite tour guides that shows you some interesting sights of Brooklyn, including locations from famous films like Saturday Night Fever. They take you out to Coney Island and back, and you get to eat good pizza at two stops along the way. It’s my kind of tour. Candle 79 was the fanciest place we ate at while in New York. Located in Manhattan on the Upper East Side, the exclusively vegan restaurant prides itself on its local, seasonal and organic produce. I kicked things off with one of their eco cocktails, the ‘Tree Hugger’, made up of a number of ingredients I’d never tried before, including hibiscus liquer and huckleberries. It was a classy start to the meal. 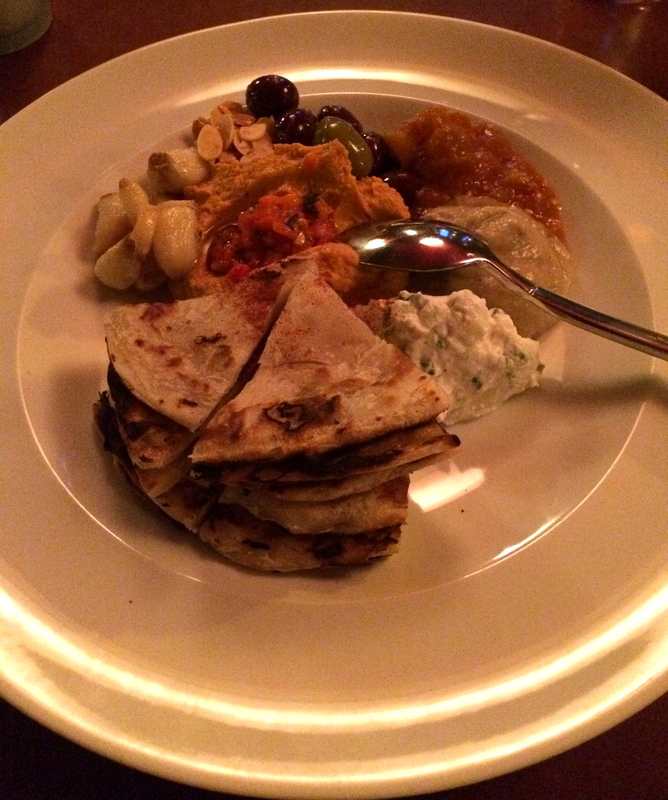 A lot of the starters were quite traditional, like a mediterranean inspired mezze platter of houmous, babaganoush, flatbread et al, and options like vegan nachos. Where as, the mains were really innovative including dishes such as spaghetti and wheat balls and herb-grilled cauliflower steak. There’s a wealth of choice to either dare to try something new and exciting or stay safe with something classic. 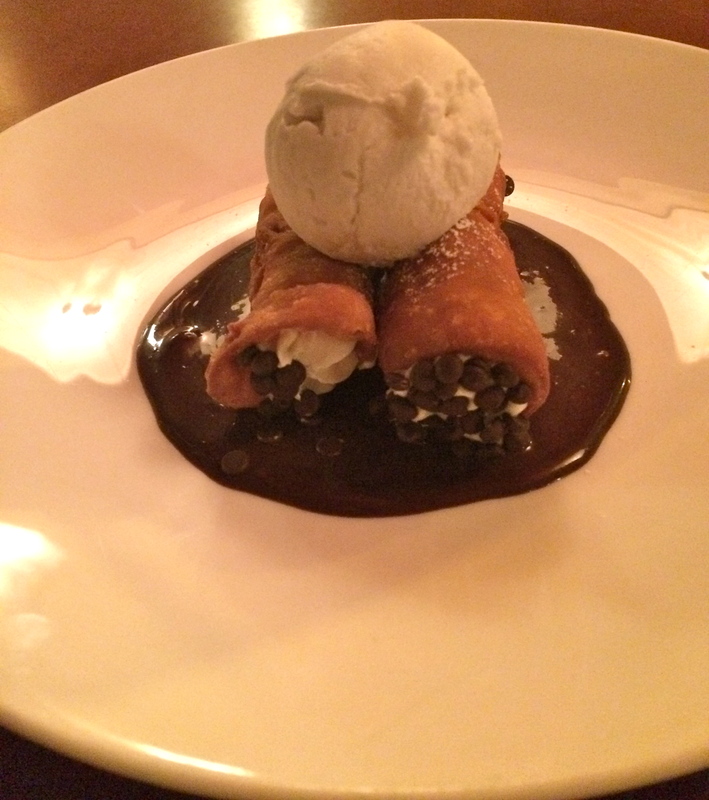 The atmosphere was romantic, the service was slick and the vegan coconut ice cream we had with our cannoli dessert was amazing. Candle 79 proved to me that vegan food can be rich and decadent. Recommended for a special night out. I know there are hundreds of great places we didn’t get a chance to visit, but I hope this gives you some food for thought if you’re going on a veggie adventure to New York City anytime soon.